By Leah Dobrinska. Jul 6, 2015. 9:00 AM. In 16th Century England, Sir Thomas More had a vast reach. From law and literature to religion and politics, there wasn’t a sphere he didn’t touch. He’s remembered both for his life as a lawyer, writer, and counselor to Henry VIII, and for his death as a Catholic martyr. His legacy lives on through the works that he penned as well as those that others penned about him. Here, we delve in to some of the many depictions of Sir Thomas More. A basic background sketch of Sir Thomas More makes it easy to see why he’s often chosen as the focus of historical fiction exposés. Born in London in 1478, More spent his early years attending top-notch schools and working as a page for the archbishop of Canterbury. He studied literature at Oxford and eventually learned common law at the hand of his father. Although he went on to establish himself as a prominent lawyer by the turn of the 16th century, his spiritual and literary studies never waned. 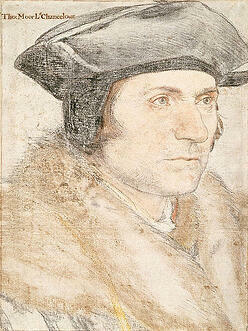 Sir Thomas More was caught between following a call to monastic life and working for the state. After a brief stint in a Carthusian monastery, he chose the latter, and went on to be a public servant for the remainder of his life. This choice would eventually lead to his death. After serving as advisor for King Henry VIII for several years, Sir Thomas More refused to condone the King’s divorce of Catherine of Argon or accept him as head of the Church of England. 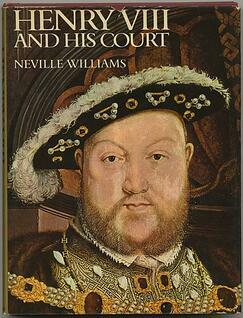 As with most everyone who stood in the way of Henry VIII, More was found guilty of treason and beheaded in 1534. One of the earliest depictions of Sir Thomas More is a play titled Sir Thomas More. The play is broken into three parts: More’s rise to ‘fame,’ his work, and finally, his fall from the King’s grace and subsequent death. Who wrote the play is often contested, with Anthony Mundayand and Henry Chettle thought to be the primary authors. Many scholars now agree that some portions of the play were written by Shakespeare; three pages of it seem to be in Shakespeare’s handwriting. Thus, Sir Thomas More is now published in many Shakespearean compendiums. The play is interesting in that it doesn’t condemn anything the king did or didn’t do. Even the actor playing Thomas More seems to resign himself to his fate. Every outcome is presumed to be at the hand of fortune rather than at the hand of a crazed monarch. Most critics posit that this take was an attempt by the writers to not displease the Tudor king who was still in power upon its publication and performance. Most recently, contemporary novelist Hilary Mantel has used pieces of Sir Thomas More’s life and death as substance for her historical fiction. Mantel’s book Wolf Hall received critical acclaim. It won the Man Booker Prize and the National Book Critics Circle Award. Wolf Hall takes a different approach to Sir Thomas More’s life, and instead places its focus on Thomas Cromwall, often seen as the antithesis of More. In The Guardian, Mantel describes how she came to write about Cromwall stating she was “driven by powerful curiosity” and that if he was a villain, he was an interesting one. In effect, she hoped to write with, “a sense of history listening and talking to itself.” Mantel’s success is obvious in both the reception of Wolf Hall itself, that of Bring Up the Bodies—its sequel—and their adaptations to television productions. Although Sir Thomas More is not the main character in Mantel’s world, or the perspective from which she writes, it is hard to argue that his actions and decisions triggered much of the events she documents. And that seems to be the case in much of history. More as a man and a martyr is always returned to for both his life and his death and what we can take from each.